In the words of our editor, who was at Loughborough University with him, "lovely guy, very humble, very fast"! He was of course talking about this week's interviewee Colin Dixon, an athlete who has been competing in mutlisport events for longer than the likes of Brownlee and Avil have been on this planet. Dixon is still mixing it with the best of them though and proved this when he returned to elite racing last year at the Windsor Triathlon finishing sixth, 16 years after he won the event. With work and family a priority, he sticks to a solid hour and 30 minutes training, on average, per day. But it's enough, as he's proved over the last couple of years by winning gold at the age-group (35-39) World Championships and bronze last year in the 40-44 age-group. Quite obviously not one to put his feet up in the off-season, Colin is currently dominating the Human Race off-road series and has won three out of three races with just one remaining. The last race looks set to be tough one with all the top UK off-road athletes racing, but even so my money's most definitely on the very unassuming, highly experienced race favourite. AE Congratulations on another great result Colin! It looked and sounded like a tough race, but you made it look easy winning by over two minutes? CD No race is ever easy! It was certainly the toughest of the series so far and I was definitely flagging by the end. I just try not to give the impression I'm in pain. AE That was the third race in the Human Race off-road series, and your third consecutive victory. The fourth and final race, the Merrell Tuffman, takes place in just over a weeks time, but with the likes of Great Britain's leading XTERRA athlete, Sam Gardner, second place finisher in the last two events, Jim McConnel, Tim McDowell and Paul Davies all on the start list it could be your toughest race in the series? CD Absolutely, Sam will raise the bar another level, but having good competition is what makes racing exciting and it's why I do it. AE Following nearly a month of snow, and ice, racing conditions have been tough, but do you think this has worked to your advantage? CD I think the other top guys are just as good at handling the soggy terrain, but I do always seem to race better in cold conditions. I really don't like snow and ice though. AE Back in November 2008 when you won Gatorade athlete of the month you were quoted as saying, 'I actually prefer off-road racing, even though I'm not that good at it', that certainly doesn't seem to be the case now, so what have you done to improve your off-road skills, because they look pretty good to us right now? CD I would still maintain I'm not that good technically on a bike, I fell off twice in the last race! I do try and make my training as specific as possible for the coming race - such as off-road hill reps and interval training on a mountain bike, and it definitely makes a difference. 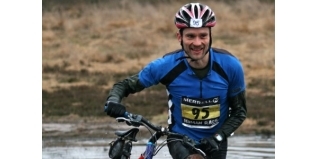 AE What would be your top tip be for someone racing an off-road duathlon for the first time? CD On the bike look ahead for hazards, get in the right gear early and try to spin a high cadence to save your legs for the run. AE What bike do you ride and are you into all the latest expensive triathlon gadgets? CD Off-road I ride a very old Giant hardtail mountain bike but it is well spec'd. On the road I have a Cervelo P2C which I built up myself. I wouldn't say I'm a gadget geek but my most useful gadgets are an SRM power meter and a waterproof MP3 player for open water swimming. AE You may be dominating the domestic off-road scene at the moment, but for the newbies who don't know you out there, you've also enjoyed a long and very successful, triathlon career - which has included winning the elite race at the Windsor Triathlon (1993), a gold medal at the age-group (35-39) World Champs in 2007 and a bronze medal at the age-group (40-44) World Champs in 2009. How on earth have you kept up such great form for so long? CD It's got to be consistent training, but never training too much. I have trained for long enough that I know exactly what quantity and quality of training I need to do to stay fit, injury free and most importantly enjoy doing it. I also do quality work all year round which I think is particularly important as you get older. AE You were racing in the same era as two of the sports greatest legends, Lessing and Smith, at the time did you have a favourite between the two? CD I wouldn't say I had a favourite. I raced them a few times but they were both miles ahead of me! Both of them had great characters and were great role models for the sport. AE You've quite obviously seen some pretty major changes to the sport since you first started racing, but what would you say is the biggest change you've seen since you started racing? CD The standard of competition and the depth in quality of the field has massively increased. There are far more people involved in the sport and now they're training scientifically, eating properly, and ride aerodynamically. Twenty years ago there would be a handful of people capable of a sub 2h15m standard distance race. Now it must be hundreds. AE It's a question that gets asked a lot but how do you manage to combine working full-time with a pretty full on racing schedule? CD It's just down to time management and making sure you don't try and overstretch yourself time wise. I train about 10-12 hours a week but make sure that each session is focused and that each week includes some high intensity work. I'm lucky that I can get out at lunchtime and occasionally cycle to work. It also helps that my children have now left home! AE What do you do when you're not racing and training? CD I live by the sea so I windsurf a lot. I also keep four chickens in my garden so I eat a lot of eggs! AE What are your racing plans for the rest of 2010 and beyond? CD Pretty much the same as last year, i.e. events where I'll get a good race. So Blenheim and Windsor, some of the national ranking series events, and the World Age Group Championships. Now I'm a veteran I may also do the odd track race for my athletics club. AE So no plans for an Ironman then? CD None whatsoever! The thought of all that extra training appalls me! To me racing is about going to head to head with people and so I much prefer the shorter events - but never say never, ask me again in ten years time.